This demo surveillance video demonstrates the HD resolution and wide angle viewing capabilities of the AHD-BL25 Wide Angle HD CCTV Camera. The AHD-BL25 is an ultra wide angle CCTV camera that has a 180 degree lens and captures 1080p HD surveillance video. For this demo, I mounted a BL25 to the ceiling of our sales office at CCTV Camera Pros. Here is a close-up view that shows how this HD security camera is mounted to the ceiling tiles. Please note the location of these two desks below and to the left and right of where the camera is mounted. Here is the view from the camera. This is a medium-size room at 29 feet wide by 16 feet deep. Notice that the camera is able to see those two desks below it and at the same time see the other side of the room clearly. There is one small blind spot right here. The effective angle of the lens is actually about 170 degrees, so this small area is not covered. When I stop here in front of the camera and wave, I'm about six feet in front of where the camera is mounted. When I position myself closer, I'll place my right hand on the wall below where the camera is mounted. You can see that only my hand is not visible, and I'm basically right below where the camera is mounted. Next, I'm going to turn off all the lights in the room. When I do, the camera detects that there is no light in the room and it turns on its infrared LEDs and engages its IR cut filter. When the camera operates in this infrared night vision mode, high definition black and white video is captured. I use the flashlight app on my iPhone so that I can make my way back into this area again. I'll turn the flashlight off and position myself again about six feet in front of the camera. You can see that the camera's infrared mode does a good job of illuminating me and the entire room. I turn the flashlight app back on so that I can make my way back over to the light switch. When I turn the lights on, the camera automatically turns its infrared LEDs off and disengages the IR cut filter so that color video is captured once again. 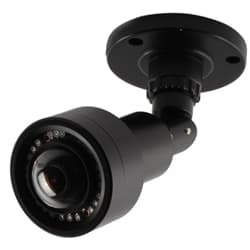 The AHD-BL25 is an AHD CCTV-type camera that must be connected to an AHD compatible DVR to record video. To make this video, we connected ours to an iDVR - PRO surveillance DVR. This camera captures full 1080p HD video. The camera's built-in infrared LEDs and night vision technology allow it to capture video in low light and zero light conditions. The tri-axis mount of the camera allows it to be ceiling or wall- mounted. The camera's housing is IP66 weatherproof-rated, which means that it could be used for indoor and outdoor video surveillance. The 180-degree fish-eye lens provides an ultra-wide angle of view. CCTV Camera Pros supplies this camera for home, business, and government use. For more information and current pricing, please visit www.cctvcamerapros.com/bl25. Thank you for watching. Click here to learn more about the AHD-BL25 Wide Angle HD CCTV Camera used in this video.